A Twitter user challenged Elon Musk, writing, "Delete SpaceX page on Facebook if you're the man?" Elon Musk followed up on a Twitter comment and deleted his SpaceX's Facebook page on Friday. Piling on to the backlash against Facebook in the wake of its user data crisis, Elon Musk deleted the official Facebook pages of his two companies Tesla and SpaceX -- after an exchange on Twitter. Musk was responding to WhatsApp co-founder Brian Acton's call to join the growing #DeleteFacebook movement in light of revelations that data analysis firm Cambridge Analytica allegedly lifted the data of millions of users without their consent. "It is time. #deletefacebook," Acton tweeted on March 20. "What's Facebook?" Musk replied on Friday. WhatsApp was acquired by Facebook in 2014 before Acton left the messaging app in 2017. Another Twitter user upped the stakes, writing, “Delete SpaceX page on Facebook if you're the man?" A seemingly out-of-the-loop Musk accepted the challenge. "I didn’t realize there was one. Will do,” he wrote, later adding that he had "literally never seen" a SpaceX Facebook page. 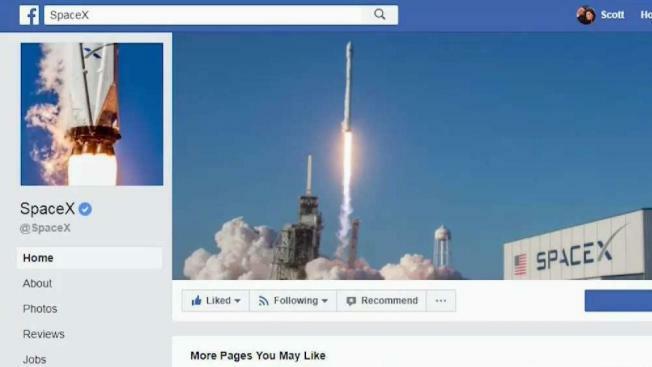 Continuing his candor, Musk said the Tesla page "looks lame" but that the SpaceX page "looks official." After being shown a screenshot of what appeared to be his personal page, Musk claimed it was the first time he'd seen it. Moments later, the Facebook pages for Tesla and SpaceX, as well as Musk’s own page, gave an error that read: "Sorry, this content isn't available right now." SpaceX confirmed the swift action, telling NBC News that Musk did in fact permanently delete the SpaceX and Tesla pages, as well as his own. The company didn't offer any other details. While Musk may have surprised Twitter users with his willingness to follow through, he was quick to downplay the move and even weighed in on Facebook rival Instagram. "Instagram’s probably ok imo [in my opinion], so long as it stays fairly independent. I don’t use FB & never have, so don’t think I’m some kind of martyr or my companies are taking a huge blow. Also, we don’t advertise or pay for endorsements, so … don’t care." Facebook did not immediately respond to NBC News' request for comment.